Do you want to resize page during PDF conversion? With the application of VeryPDF PDF to Any Converter, you can easily resize page during the conversion of PDF to other formats. First of all, you need to download installer of VeryPDF PDF to Any Converter from one of the following links according to your computer system: VeryPDF PDF to Any Converter for Windows or VeryPDF PDF to Any Converter for Mac, then double click the installer and follow setup wizard to install it into your computer. In this article, it will take converting PDF to Word with VeryPDF PDF to Any Converter as an example to show you how to resize page during PDF conversion. Drag and drop a PDF file or click the button [Add] to a PDF file to VeryPDF PDF to Any Converter. For your conference, the button [Delete] can be used to delete PDF files you have added one by one and the button [Clear] can be used to remove all the PDFs in the list. Click the button [Setting] at the top of the main panel of VeryPDF PDF to Any Converter. In the middle of “Basic Setting” panel, find the section of “Resize Page”. Then tick the square box besides “Resize Page” and input numbers（say 360*160） into the to box besides “Page Size (Pixel)”.Next, click [Apply] to enact it. Now comes to the last step. Click the button [Choose] to specify a destination folder, and the click the button [Start] to start the conversion. The conversion will be done in a few seconds. If you have any questions about how to resize page during PDF conversion, please write your comment below or email us via support@verypdf.com. 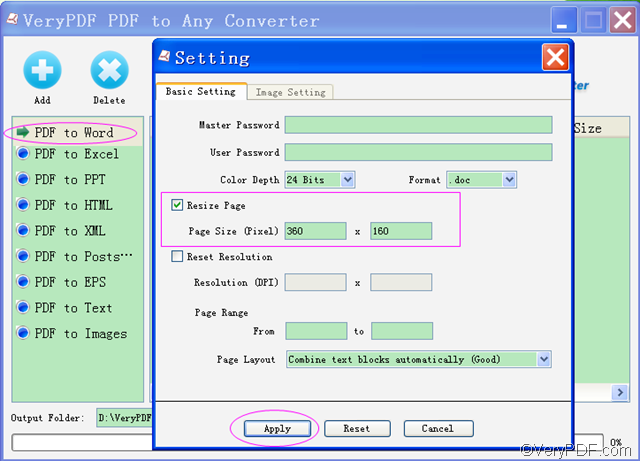 You can also try other products such as VeryPDF PDF to Word Converter , PDF to Image Converter, etc. How to share your photo easily?